PORTAGE -- Catherine H. “Kate” Murphy, age 89, of Portage, passed away on Wednesday, April 10, 2019, at Agrace HospiceCare in Fitchburg with her five children by her side. Kate was born on February 28, 1930, the daughter of Joseph Julius and Anna Sophia (Gorman) Weber. Kate met Russell Murphy while she was working at the Portage Clinic. They were married on April 24, 1954, at St. Mary of the Immaculate Conception Catholic Church in Portage. As a Homemaker, Kate raised six children. Great family conversations were often held in the kitchen while she prepared home cooked meals or baked another batch of cookies to fill the cookie jar. Kate was an active member of many organizations, including Women’s Legion Auxiliary, Civic League, and Catholic Women’s Club. In addition to giving of her time, Kate was also very generous with her resources and supported many organizations. Her favorite organizations were those that helped children. Kate was a lifelong member of St. Mary’s Catholic Church in Portage, where she served on many committees and sang in the choir. She loved to play cards her whole life and was active in several Euchre groups. Her favorite things to do included spending time with her family, spoiling her grandchildren, and cheering on the Packers and Brewers. She is survived by five children, Pat (Stan) Scharch of Madison, Jean (Jim) Rader of Naperville, IL, Ann (John) Dundas of Hales Corners, Steve (Lana) Murphy of Lake Mills, and Julie (Steve) Joosten of Oak Creek; her son-in-law, Greg Wicke of Cambridge, 23 grandchildren; 7 great-grandchildren; her brother-in-law, Tom (Kathy) Murphy; her sister-in-law, Audrey Murphy, other relatives and many close friends. She was preceded in death by her parents, her husband Russell, her daughter, Rita Wicke, her sister, Margaret Weber, 3 brothers, Francis, Edward and Clifford Weber, 3 brothers-in-law, Ken, “Duke”, Don and Jim Murphy, and 3 sisters-in-law, Alice Murphy, Marian Murphy and Marie (Weber) Jirsa. Mass of Christian Burial will be at 11:00 a.m. on Wednesday, April 17, 2019, at St. Mary of the Immaculate Conception Catholic Church in Portage with Fr. Gary Krahenbuhl presiding. Burial will follow in St. Mary Cemetery. 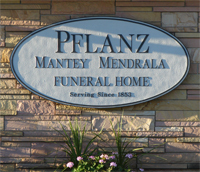 Visitation will be from 4:00 p.m. until 7:00 p.m. on Tuesday, April 16, 2019, at the Pflanz Mantey Mendrala Funeral Home in Portage, with a Scripture Service held at 4:00 p.m. Visitation will also be held from 10:00 a.m. until 11:00 a.m., on Wednesday at the church.